<—There! See it? I WON! I did it!! I wrote 50000+ words in a month! Not bad guys! Not bad, for an old grumpy Bear. I am so proud of myself! 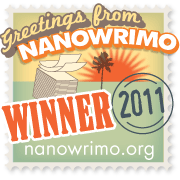 When I finally got what this NaNoWriMo thing is about, it was actually quite easy. I just had to understand that writing a novel is all about stringing episodes together and that it doesn’t matter if the episodes ‘appear’ in order – the order can be sorted out once they have all been written. Heck yeah, this was fun! Now I am going to stand on the side-lines and cheer my wife on, she still has about 10k of words to write, and only three days to do it in. But hey, she can do it. she has written 32000 words since the 13th. You should go and see her NaNo Stats – that recovery curve is mind boggling!